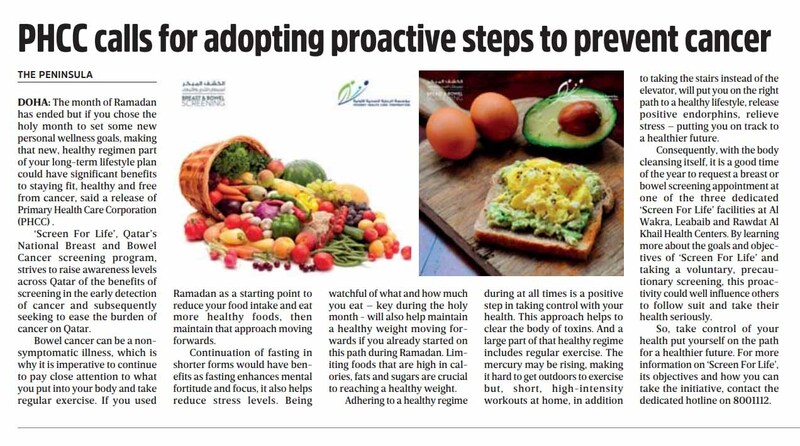 DOHA: The month of Ramadan has ended but if you chose the holy month to set some new personal wellness goals, making that new, healthy regimen part of your long-term lifestyle plan could have significant benefits to staying fit, healthy and free from cancer, said a release of Primary Health Care Corporation (PHCC) . ‘Screen For Life’, Qatar’s National Breast and Bowel Cancer screening program, strives to raise awareness levels across Qatar of the benefits of screening in the early detection of cancer and subsequently seeking to ease the burden of cancer on Qatar. Bowel cancer can be a nonsymptomatic illness, which is why it is imperative to continue to pay close attention to what you put into your body and take regular exercise. If you used Ramadan as a starting point to reduce your food intake and eat more healthy foods, then maintain that approach moving forwards. Continuation of fasting in shorter forms would have benefits as fasting enhances mental fortitude and focus, it also helps reduce stress levels. Being watchful of what and how much you eat – key during the holy month – will also help maintain a healthy weight moving forwards if you already started on this path during Ramadan. Limiting foods that are high in calories, fats and sugars are crucial to reaching a healthy weight. Adhering to a healthy regime during at all times is a positive step in taking control with your health. This approach helps to clear the body of toxins. And a large part of that healthy regime includes regular exercise. The mercury may be rising, making it hard to get outdoors to exercise but, short, high-intensity workouts at home, in addition to taking the stairs instead of the elevator, will put you on the right path to a healthy lifestyle, release positive endorphins, relieve stress – putting you on track to a healthier future. Consequently, with the body cleansing itself, it is a good time of the year to request a breast or bowel screening appointment at one of the three dedicated ‘Screen For Life’ facilities at Al Wakra, Leabaib and Rawdat Al Khail Health Centers. By learning more about the goals and objectives of ‘Screen For Life’ and taking a voluntary, precautionary screening, this proactivity could well influence others to follow suit and take their health seriously. So, take control of your health put yourself on the path for a healthier future. For more information on ‘Screen For Life’, its objectives and how you can take the initiative, contact the dedicated hotline on 8001112.